Some months ago I decided to buy a new postal scale that would handle more weight than my little scale. I also wanted a digital scale so I could better set the postage rates for items I sell in my Etsy store. So I trudged over to the Fry’s Electronics a mile from my house and roamed the acres of store till I found a small selection of scales. Twenty dollars and a few minutes later I was home with my new scale…or not. I took the scale out of the box and it looked used. Well, I’m sure it had been used. It had scratches and something sticky on it. Back to Fry’s once more for another one. Back home. Alas, the second scale did not work. Refused to work. And to be honest it was made of lightweight plastic and seemed cheap and flimsy. I went back to Fry’s for the third time that day. This time to get a refund. They say “three times a charm” but I no longer even wanted a replacement scale. The whole experience was a disappointment and a colossal waste of time. 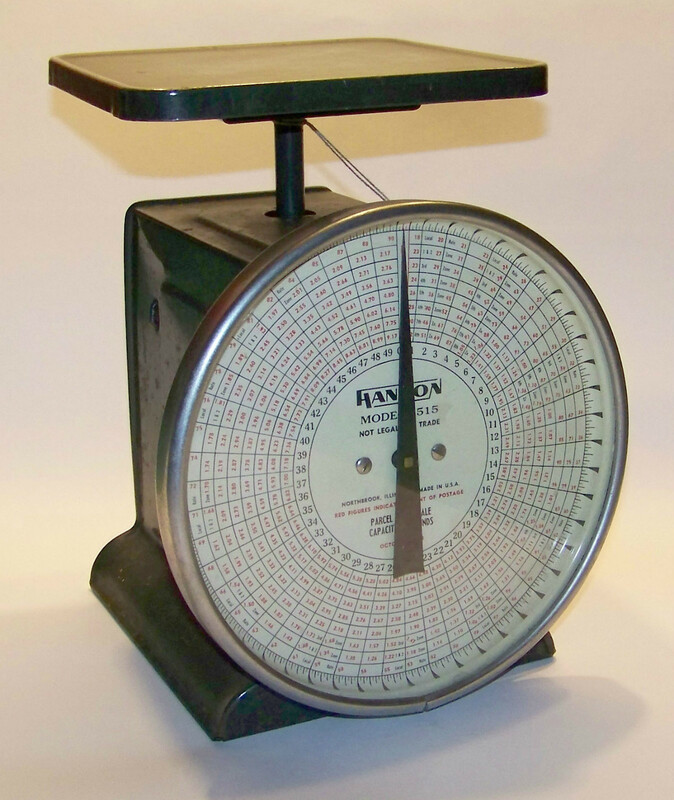 Since then I’d been muddling along with my little scale until I stumbled on the scale of my dreams on eBay: a sturdy, metal 1953 Hanson scale (capable of weighing up to 50 lbs.) with the most beautiful face. It has a bit of rust on the body, but that just adds to its charm. Yes, it cost more than $20…$30 plus $13.45 shipping (to be exact), but this scale is not going to break or need batteries. Plus I love looking at it. I would be happy just to display it! And that’s why I love vintage…in a nutshell it’s the quality and charm! What charming thing do you love? i love your hanson scales. a b s o l u t e l y fantastic! Thanks Edwina…I checked out your blog and fell in love with your great collections! Sharon…I know! I’ve given up on Fry’s. I think my new, OLD one will last longer than me! That’s a superb idea! I use a crappy digital one. Why did we go so far away from mechanical, anyway? Beautiful scale! People these days are so enamored of disposable devices. We don’t want to be bothered with fixing anything anymore and just want more and more things done for us instead of by ourselves. It’s kind of depressing, this whole, “Why make something when you can buy it?” attitude. If the thing I buy is truly the same or better than what I can make myself, then fine, but otherwise, I make it because it’s better that way. Why use old things when there are new shiny ones? Because they so often stink? As you know from your comment on my post today, I love my vintage lunch box, but I also have old phones, cameras, and coats that I just love. I’ve also got a thing for old cigar boxes. I am actually glad now that the crappy, cheapo, plastic scale from Fry’s didn’t work because now I have this lovely Hansen scale! And I so appreciate the other vintage stuff you like. I bought an old Kodak camera (#1 Autographic Kodak Junior) just because I think it looks fabulous (it’s the one in my masthead). Thank you! I truly appreciate the compliment. I noticed that old Kodak – wasn’t sure what it was but knew it was beautiful! I’ve got an old Poloroid instant camera (http://it.wikipedia.org/wiki/File:Polaroid_Land_Camera_100_IMGP1932_WP.jpg) that we had when I was a kid. I still remember pulling the film out and waiting for it to magically appear on the paper. Oh and how that flash would blind us! We’d have to change the burnt-out bulb before we took another picture. I would love to use it but I’m not sure if there’s film for it anymore. Maybe one day I’ll do a post on it. In fact, you’ve inspired me to do a series of posts on the other vintage things that I love. Leonore, can’t wait to see more of your favorite vintage things!! P.S. the Land Camera looks so cool!